18 days until Spider-Man 3!! Liked the pic of Peter and his amazed look. The pic of Peter ans Gwen was nice. Loved the pics of Peter and MJ. All the pictures from this scene are just incredibly fun. MJ is being awfully happy for him, despite how she's feeling right now, but that'll come out more in the next day of pics. MJ and Peter look really great in these pics. This must feel unusual to Peter because Spider-Man has never been thanked on this scale before. Hopefully he doesn't let it go to his head. MJ must be proud of her guy. I can't wait to see what Peter tells Gwen about what to say about Spider-Man. That should be good. I know I ♥ Spidey! 'Bout time everyone else caught up! lol. You are right about that - there are definitely some parallels. Although Peter's not used to being loved, the same way Superman has been. So I think it goes to his head faster, possibly. something Superman Returns took advantage of in making Lois intially dislike him for the first time ever in movie continuity -- is that ever right! It was really fun to play around with in fanfic as well. I want one of those balloons too! So cute! And I adore the pics from this scene, they are almost my favorites from the whole movie. OMG! 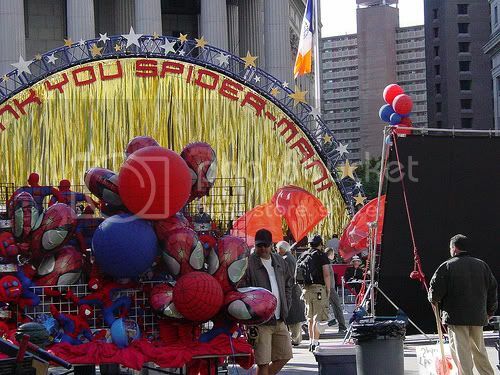 I want one of those Spidey-balloons!!! Oh yeah! I hope they have them for sale this summer! Aww, I <3 MJ and Peter. Oh, love those pics! The second one and the last one are pretty great!!!! They are! And looking at these again, I realize that quite a bit of this scene was cut from the movie as compared to the book! (Gwen and Peter's talk, the little boy Peter's crouching down for...) Obviously, they shot it all, so I hope we get it back in deleted scenes.